This wallbowl features many shades of elegantly striking bright reds. 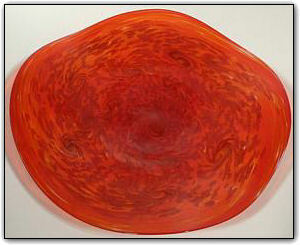 Bright red is the hardest color to achieve which is why bright red glass art is very rare. The color red in blown glass is made from gold which is a soft metal, it must get hot enough to melt but if it gets too hot then it burns and turns brown. Its a very fine line and a great challenge to work with red, and these colors came out absolutely perfect. Make sure to zoom in to see how the the various shades of red interact with each other in almost lacelike patterns swirling throughout... so amazing!